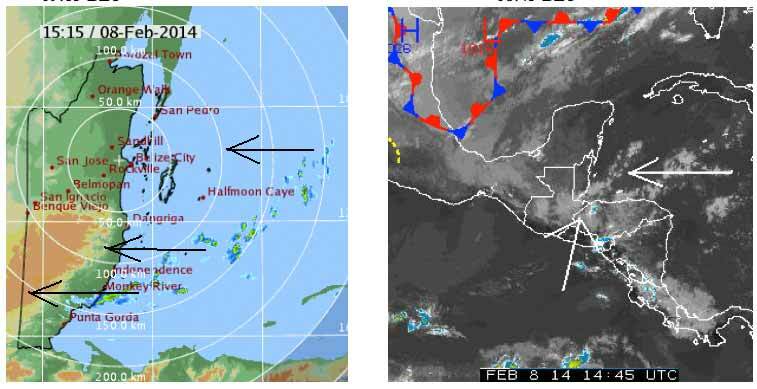 Belize NMS: A light northeasterly airflow over our area will become a bit more moist during the next 24 to 48 hours. 24-hour forecast: Sunny with some cloudy spells today and cloudy at times tonight. A few showers will occur mostly along the coast this morning and tonight and over inland areas this afternoon. Today: Winds: NE'ly 5-15 kts. ; seas: Light chop - choppy. ; waves: 2-4 ft.; a few showers. Tomorrow: Winds: NE-N 5-15 kts. ; seas: Light chop - choppy. ; waves: 2-4 ft.; a few showers. Marine Outlook: Sunday night:- Winds: NE-N 5-15 kts. ; seas: Light chop - choppy. ; waves:2-4 ft.; a few showers. General Outlook: For Sunday and Sunday night is for some cloudy spells with a few showers mostly over the south and along some coastal areas. Last edited by elbert; 02/09/14 04:06 AM. On Ambergris Caye this morning it's calm, clear and beautiful with an expected high of 84.and a North NE at 2 mph. Those earlier showers this morning have been and gone. . .. .But there is now a heavier band of showers moving in from the Caribbean. 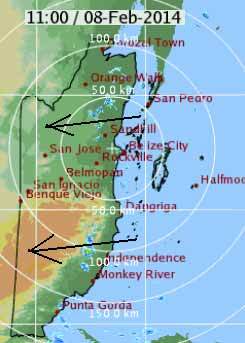 Already effecting PG area, Stan Creek area later and might still be active when that line gets to Belize city area, or it might dry out as the sun bets hotter. I think that is being caused by the higher Tropical cloud ( blue ) coming up from the SSW. A bit early, be we have to start to watch what comes up from the Pacific off Panama. Ice storms in the US and Canada have effected power in those areas and the flow of information for our weather forecast. I'll do what I can to update this mornings weather report. Cloudy at times tonight and cloudy with sunny periods tomorrow. A few showers will occur mostly over central and some coastal areas tonight and tomorrow morning then inland later on Sunday. Presently it's 72 f. with an expected high of 84 on the coast and 88 f. inland. Power has been out all morning on the island as well, doubt if it's ice! A cloudy start this morning on Ambergris Caye but the day has turned out nice with a high of 84 and the wind from the East at 2 mph, we have a calm sea. Last edited by elbert; 02/09/14 11:02 AM. Love this clam sea.... tasty! fixed it, thanks, I do that a lot. Power is still out in areas of the North West US and our weather guy is down. Cloudy at times today and partly cloudy tonight. A few showers will affect mostly the north and inland areas today, becoming isolated tonight.